Lugar can't claim 3200 Highwoods Court as his residence as he has been doing for the last 41 years. When he goes in and votes and signs absentee ballot applications claiming that address as his residence, he is committing a felony each time. I'm new here, so I'm probably not the first to say this ~ I know you're a lawyer, but simply highlighting text in bold and saying, "That doesn't apply" doesn't make you the final arbiter. A review of something like this requires an incredibly deep contextual review of the relevant definitions and circumstances. It seems irresponsible and reckless to make such sweeping truisms without any analysis. It seems even more questionable that you would accuse someone of a felony in the same manner. I suppose it is easy to do when arm-chair quarterbacking. Good point. Has anyone talked to the Indiana Election Commission? You're trying hard to make an easy legal issue into a complicated one. That constitutional provision/statute applies so that someone doesn't lose his or her residence because of service for the State of Indiana or the federal government. But that's not what happened. Lugar lost his residency at that precinct because he sold the house and another family moved in, not because of his service in D.C. That is not in dispute. That takes you to the issue of voting using an address he hasn't lived in for years. Again, that is a black and white legal issue. You can't do it...doing so is a felony. I didn't hear people complaining that the law was gray and complicated when it came to Charlie White. Those exact same laws apply to Lugar. Steve...the Marion County Prosecutor would have jurisidction because we're talking alleged crimes, not issues of one's qualification. Besides he's a federal candidate...that would be the Federal Election Commission. Prosecutors "make such sweeping truisms" every day, though they are not the final arbiters. Lives of innocent people are ruined. Politicians don't shed any tears. Lugar supported a war based on lies, and endorses constant assaults on the homes of Americans by paramilitary police forces invading the privacy of people choosing to (or not to) use intoxicants. He deserves no better. Politicians are treated with kid gloves by the media, and it is unusual when they are held accountable. This seems pretty simple to me. If Lugar had updated his registration to his family farm when he sold the Washington township home, he would be perfectly fine. His Indiana residency is not at issue and it isn't relevant to his voter registration. Of course Lugar maintains Indiana residency when he is in DC on business. He doesn't lose residency at his FARM's precinct by being in DC and not living at the farm regularly. As you point out, it seems obvious that he lost residency at the Washington township residence for voting purposes when he sold the property and he should have updated it to his farm property that, I may be wrong but I believe, his own staff has said qualifies as his residence even though he doesn't live there continuously when he's in Indiana. And, they are correct on that, but you can't have both at the same time- a farm that is the residence you maintain for Indiana residency purposes and a voter registration at an address you haven't lived at in decades. When Lugar sold the Washington township property did he not "move" to his farm? Of course, under the Bayh standard, I don't even know if it's necessary to maintain any property for Indiana residency, but it doesn't change the fact that for voting purposes it seems he should be registered at his farm and not the home of totally unrelated people who are the subsequent buyers from who he originally sold the property to. That does not make sense. Paul - the Constitution is clear; one does not lose their residence due to service on behalf of the State or the Country. In applying your logic, you would be advocating for the largest disenfranchisement of Hoosier voters since prior to 19th Amendment - you would strip voting rights from every man and woman who has put their life on the line defending their country in the military. The law is clear - your logic is circular. Art. 2 Sect. 4 provides protection from losing one's residence due to service on behalf of the State/Country. When Lugar was first elected to Congress, he was registered at that address - regardless of later activities, that registration remains valid because the Constitutional protection afforded people serving our State/Country. Paul - while you were busy researching a baseless agrument that's blatantly incorrect, Senator Lugar was busy fighting on behalf of 6 million + Hoosiers. The Constitution is clear - one does not lose residence for service of State/Country. To invalidate that protection is circular logic and contrary to the Indiana Constitution. @ Erin - property ownership is not a requirement for voting registration. Advocating for such a standard would set this Country back 200 years. @Wilson- I'm aware of that. But, if you sell your home to unrelated people and no longer live at that residence, other people do and you then rent/buy or stay at another property (his farm) you have to change your voter registration to reflect that. The only way this makes any sense is if Lugar is claiming that when he sold this property in the 1980's he never lived anywhere in Indiana and was continuously out of the state in DC up until now. That he never lived at his farm after the sale of his Washington township home. This doesn't seem like what has been said in the past about the farm. As to military voters, "absentee uniformed services voter" according to Indiana law, that is governed by a completely different part of Indiana statute- IC 3-5-2-1.5. Only those that qualify can take advantage of that statute- as in military servicemen and women- and are in no way affected by what Paul is discussing as to Sen. Lugar. @ Erin - I think you see my point; since the Senator has been in office since 1977, he has been out of the state on business on behalf of the state. Therefore, the Constitution protects him (and other members of Congress as well as our members of the military). The protection dates to his first day of service on behalf of the State/Country. Should the Senator retire, he would then need to re-register at his residence prior to whatever election would come next. You have an excellent exlanation. Yes, he could have changed the residence to the farm. Then he could have voted out of that precinct. The problem here is that he sold that house and a completely different family moved in...but yet he continued to use it as his residence. It was just sloppy on his part. Anyone with any legal training around Lugar should have alerted him to the problem with what he is doing. Paul - you seem to think that the sale of the property invalidates his residency as of of his first day in Congress. See my prior post re: the protection relates to first day of service. "the Constitution is clear; one does not lose their residence due to service on behalf of the State or the Country." I agree 100%. The problem with your argument is that is not why Lugar lost his residency. He didn't lose his residency at 3200 Highwoods Court because he went to serve in Washington, D.C. He lost it because he sold the house and another family moved in. Think about it...the purpose of the law is to protect Hoosiers who go off to serve the State or federal government from claims they became residents of the place where they are working. So you're protected from claims you lost your residence because of service. But you're not protected from claims you lost your residence for OTHER reasons such as the fact you sold the house and another family moved in. All Lugar had to do when he sold the house is change his voter registration address to reflect another residence. He could have used his Decatur Township farm and voted down there. It wouldn't take much for him to claim he lived there. He could have tossed a tent in a field and claimed he slept there. It doesn't take much for someone, especially a U.S. Senator to make a valid claim of residency. But when you're claiming your residence as someplace where a completely different family lives, you have a big problem. When you start signing perjury affidavits saying you live there and are voting in that location...well that is a felony to do that. No doubt about it. The issue is not his qualification to serve in office. The problem is a Charlie White one....voting where he doesn't reside and cannot even make a claim of residing since there is another family there. You keep citing a law that applies to prevent a person serving the state or U.S. Government from losing their residency because of service. But you are missing the point that that is not why Lugar lost his residency at 3200 Highwoods Court. He lost it because he sold the home and another family moved in. He should have changed his voter registration but he didn't do it. It doesn't take much of a lawyer to figure out Lugar screwed up big time. You can't go in and sign under oath that you live at 3200 Highwoods when you sold the home decades earlier. You can't go into a polling place and tell election clerks you live at 3200 Highwoods Court when you don't. "Asked how Lugar's team would respond if challenged about his residency, Helmke shot back, "We'll be happy to talk about the farm." "It's not an issue. They can try to make it an issue. We'll be happy to talk about the farm and what it means to him," Helmke said." Sen. Lugar's own staff's statements suggest that the Senator considers his farm to be his current Indiana residence and he should be registered to vote there in that case. You'll note, he did NOT say, the Senator has been continuously out of the state on business and maintains his residence that he had when he left the state- in Washington Township. That's the problem. I think the constitution protects Sen. Lugar, as it should, from being challenged for Indiana residency or voting purposes at his farm- not where he lived in the 1980's and doesn't have any residency claim to. Members of Congress move within their districts and the state all the time and they certainly do change their voter registration to reflect that. I know that for a fact. If you're suggesting that they don't need to do that because they are in office, I think that is a leap of constitutional interpretation. @Wilson, I think Paul has explained his position pretty clearly, but I thought he did so initially in the blog post as well, and you still seem to be missing the issue at hand. Neither Lugar nor any other senator or representative loses their residency by spending time in Washington and working outside their home state. He is still a resident for purposes of his service as a US Senator representing Indiana. Lugar, however, appears to have continued voting in Indiana, claiming to reside at the Washington Township home, long after he had moved out. This is a completely different issue. Paul, I read your blog a lot and appreciate what you do, but is this a joke? I love a good conspiracy theory as much as the next guy, but this is pretty out there. If Evan Bayh can run for SOS after living in Virginia/DC for his entire life, I think Lugar's in good shape. It requires "legal training" to comply with the law requiring that you vote where you live? The media aren't exactly falling over themselves to report this, are they? And having a felony is not a disqualification for federal office. However you read the law, this looks bad for Lugar. It's certainly something Mourdock and others might seize upon in a primary campaign. I don't know all the details of Mr. Lugar's situation, but I know this: Mr. Lugar didn't accept income to represent an area to which he did not reside (he has residence's in Indiana) Mr. White defrauded Carmel by collecting his pay and voting as a part of his elected position when he no longer lived in Carmel--he lived in Fishers. He didn't have to move to Fishers to represent Carmel. 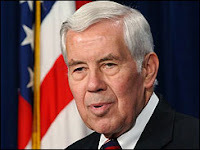 Mr. Lugar does have to go to DC to represent Indiana. I don't find that gray--I think that's pretty clear. Charlie White blatently broke many laws and defrauded the City of Carmel as well as the residents of the district he represented. No way to spin that, plain and simple. Charlie White blatently broke the law. He defrauded the City of Carmel of pay when he collected that pay knowing he moved to Fishers. He did a disservice to his constituency to pretend he held the residency to represent them when he did not. And then he voted in a precinct where he did not reside for elections he did have a right to cast a vote. He did not have to go to Fishers to represent the people of Carmel. I don't know all the details of Mr. Lugar's situation, but I can clearly see with no gray areas that his situation is nothing like Mr. White's situation. sorry for two posts. I thought the first one was lost. I guess it wasn't. Many of you are missing the real intent of the law. The most relevant law at play is not to protect Lugar from losing his eligibility to be an Indiana elected official, but to protect Hoosiers from being represented by someone who is not one of them. Seen in the proper light, Charlie is far closer to being a Fishers resident than Lugar is to being a Hoosier. Seems Lugar was a resident who failed to file properly. This won't serve to challenge his candidacy, only his credibility. Don't you have to provide information (like a utility bill, etc) to establish residency in another precinct? If Lugar moved to DC and sold his house after he was elected, how would he be able to do that? Definitely a gray area, but one I don't have a problem with legally. I DO, however, take issue with the fact that he DOESN'T LIVE IN INDIANA ANYMORE! How can he effectively represent Hoosier interests when he lives in DC? You're looking at it completely wrong - think of his residency as being "frozen in time" as of his first date of service in the Senate. That's what the Constitution protects - one does not lose that residency for service. If Lugar were to retire, he would need to re-establish residency at another address in order to vote. Until then, he is properly registered, and well within the intent of the Constitutional protection afforded him. "The Frozen Man," it's a good JT song. "You're looking at it completely wrong - think of his residency as being "frozen in time" as of his first date of service in the Senate." I can think of unicorns, too. They're about as connected to reality as that half-baked argument. Wilson, about that "frozen in time" argument, are you suggesting that Visclosky can move from NWI to New Albany and run in perpetuity for Congress from the First District because, at his first election, his NWI address was "frozen in time?" What Paul is saying is he is till a resident of Indiana but he committed a felony by voting in the wrong place. They always ask you if this is your correct address before you vote. He obviously stated yes and signed the book so I would say he would have to be a complete idiot by not realizing this fact. I am missing something here??? "Wilson, about that "frozen in time" argument, are you suggesting that Visclosky can move from NWI to New Albany and run in perpetuity for Congress from the First District because, at his first election, his NWI address was "frozen in time?" Absolutely - there is no requirement that someone actually live in their Congressional district in order to run for that district. Someone residing in Evansville could run in the CD-3 if they wanted.